Sadly, it's winter and the end of fresh herbs from the garden (sage seems to be surviving still). 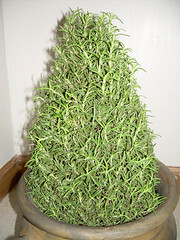 We saw this cool mini-christmas-tree looking rosemary plant the other day at Whole Paycheck Foods and decided to take it home. And subject it to a slow, mold-induced death. Ideally, we'd like it to thrive indoors until spring and maybe even have some to harvest for our focaccias and roasted roots. But, we don't have good luck with these things. They generally look ok for a couple weeks. Inevitably, mold sets in and it's just a matter of time from that point. So, if anyone has luck wintering these things, shoot me some advice via the comments. I'll keep you posted on its "progress". Currently, it's a week old and it has a surprising amount of new growth. I'm afraid to water it. Time of death, early december. I am glad to know I am not the only rosemary killer. I went through 3 last year. I finally decided that it couldn't just be me! I will just pick mine out back until it freezes. Sigh. Rosemary grows like a weed here, you cannot kill it. My uncle uses it as a hedge, maybe 7 feet tall and over 9 feet long. Okay, so it probably needs some sunlight. But getting it too close to a window may cause the temperatures to rise and lower too darned sudden. So, not IN FRONT of a window. Get Eleanor's VF-11 and use it each time you water, maybe a half gallon each week depending upon size of pot. Check dirt an inch down, if it's wet, don't water. Once placed, don't move it. You could spin it every 3 to 6 months. If it tends to mold, there's too much moisture. Set up a fan at night in the room. The movement of air should dry things up a bit. Sit next to it and have some cold beers, stick your finger in the dirt and say hi. Drink beer, put finger in dirt. Got it. Thanks. Actually, that method could be used for many things. OMG! Mine mysteriously died, and so did my neighbors.